Helping your child with their homework can be a stressful experience - particularly when you're unsure of the correct answers yourself. But few might expect to find themselves confused over a task set for a four-year-old. Mother Annie Jordan, from Plymouth, revealed how she had been left completely stumped over one question set for her four-year-old daughter - and many others were just as baffled when it was shared online. The sheet features a series of pictures, with pupils required to write what they are in the boxes next to them. The first five answers, which were all three-letter words such as 'pan' and 'tap', had already been filled in by Annie's daughter. However, the last question - which features a picture of what looks like an ice rink - proved to be a stumbling block. Some Facebook users suggested that the correct answer was 'ice'. 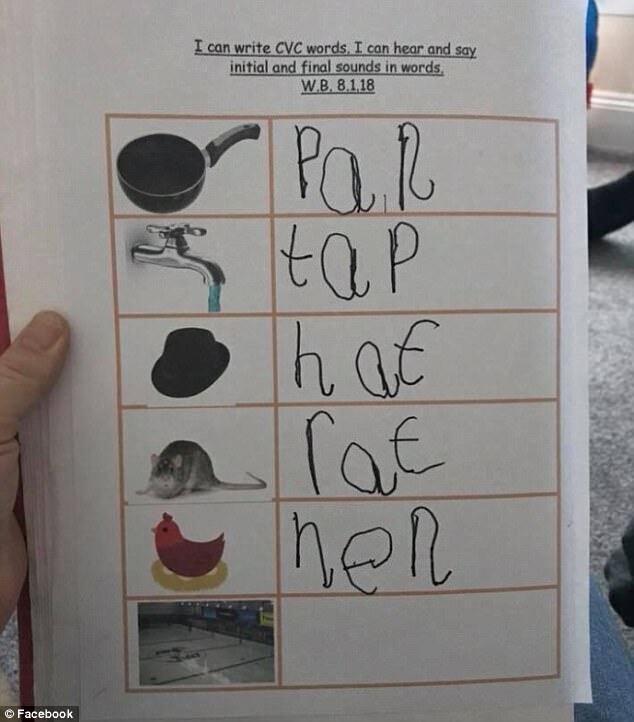 However, others pointed out that this could not be right because the top of the sheet states they are all CVC words, which consist of a consonant, vowel, consonant. Other suggestions for the final picture included 'net', 'wet' and 'rink', although some suggested that the latter did not fit into the CVC pattern. Annie later confirmed that the teacher had told her the correct answer is indeed 'rink'. Explaining the answer, another Facebook user posted: 'In phonics this would count as a CvC as three sounds r i nk'. My question is: WHY is a 4-year old having to do homework? The "n" and "k" give two different sounds to the word. It is not CVC. It is CVCC.